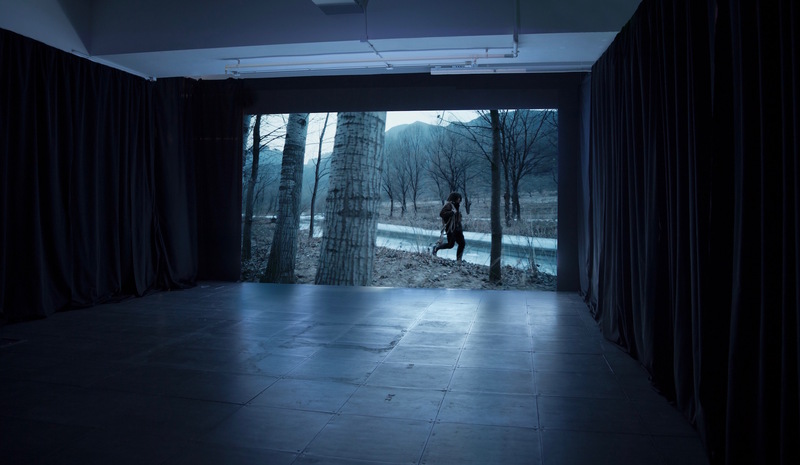 de Sarthe Gallery is pleased to announce Liang Ban’s second solo exhibition with the gallery, Diary of a Pioneer. The show features all new work and opens on 27 January, 2018. It will continue through 17 March. 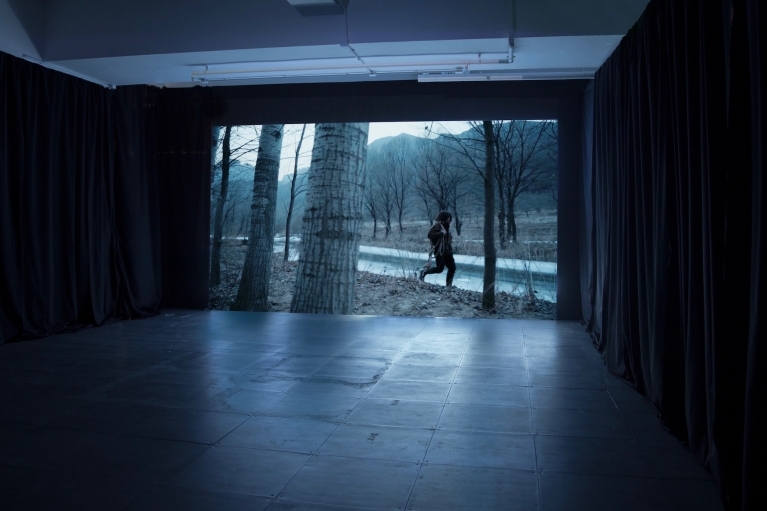 This is Liang Ban’s first solo exhibition in Hong Kong. The exhibition questions a conventional understanding of culture in which civilization and nature are diametrically opposed. With surrealist and humorous undertones, Liang Ban argues our idealized notion of a civilization constantly in progress dilutes a more complicated reality in which our relationship to nature and wilderness are closely connected. Within only four artworks, the exhibition carries viewers to a point of cathartic reflection on the impossibility of understanding human civilization. 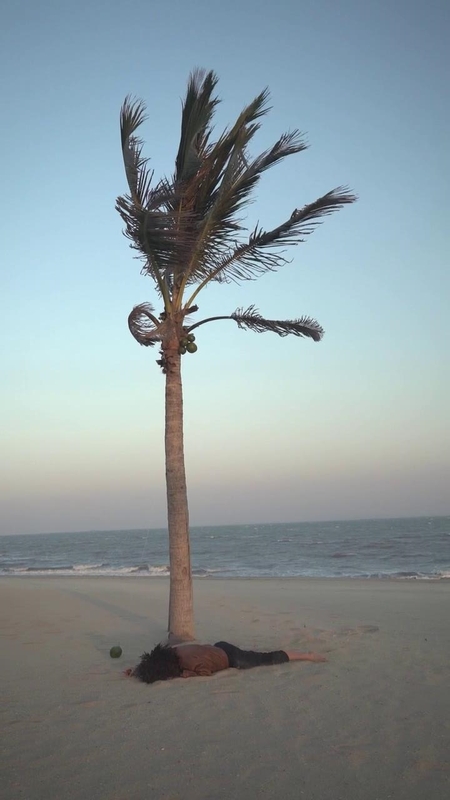 The first artwork in the show, Pirate Utopias is a video installation that takes its title from American writer Peter Lamborn Wilson’s book, which comments on the weakness of free will. 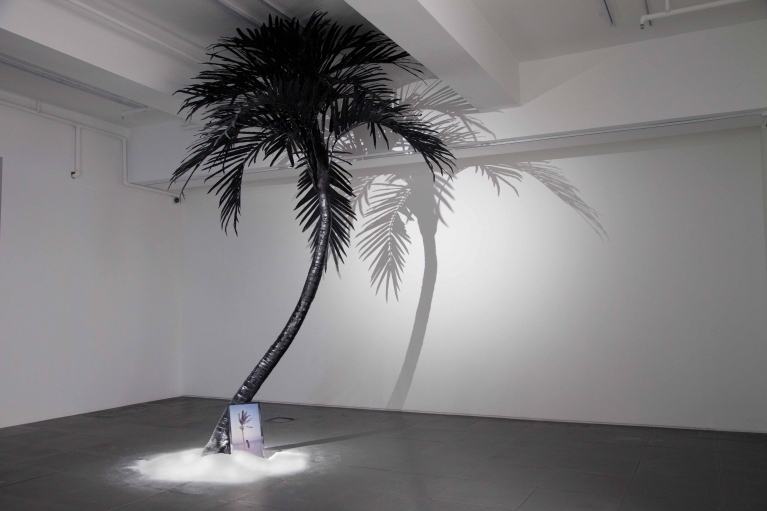 The installation features an LED television placed on a bed of white sand under an artificial palm tree. 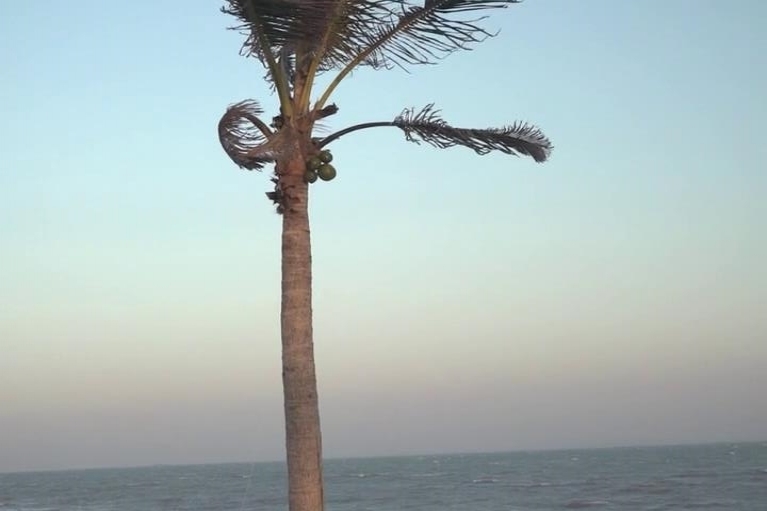 The video shows the artist himself dressed as a pirate, taking a photo with his mobile phone of a coconut hanging on a palm tree, shaking his phone, and then being knocked out by the subsequently falling coconut. Through absurd coincidence, it seems as if the act of shaking the digital image of the coconut has caused the physical coconut to actually fall, leaving viewers with a comical but unsettling metaphor. 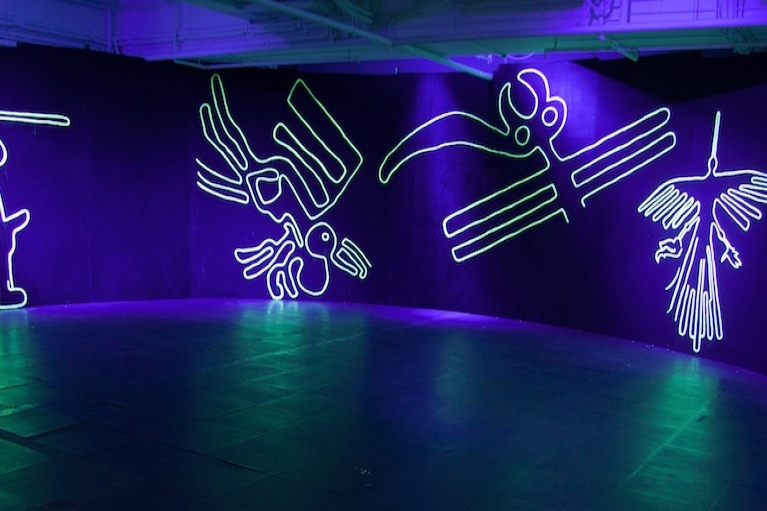 Neon Wilderness: Nazca Lines is the largest installation in the show, transforming both the shape and nature of the gallery. The artwork directly references the Nazca Lines in Peru, which are a series of massive geoglyphs that were carved in the earth between 1,500 and 2,500 years ago. Although anthropologists believe they were created by the ancient Nazca people, the large pictographic symbols are popularly believed to be made by aliens. Liang Ban reproduces these famous lines in phosphorescent paint on the walls of a large custom built curved black room. 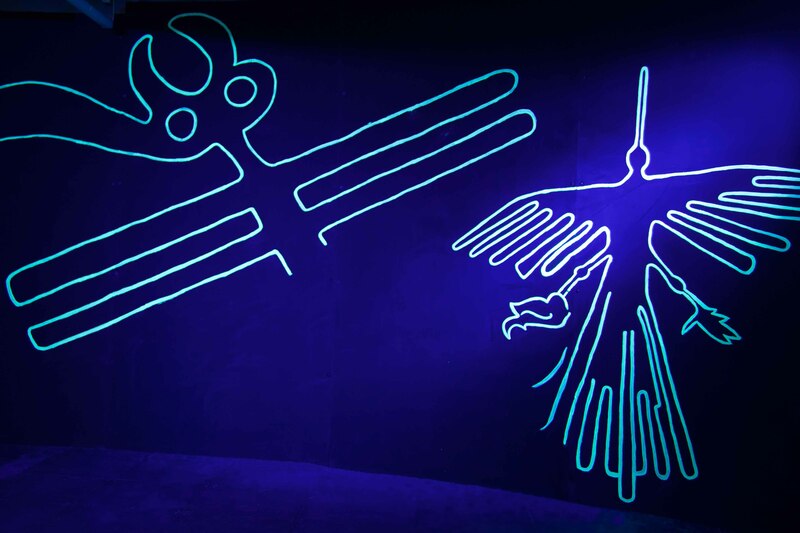 Through this installation Liang Ban emphasizes not only the mystery of how and why an early human civilization created the lines, but also why it is easier for some to believe aliens made the lines. 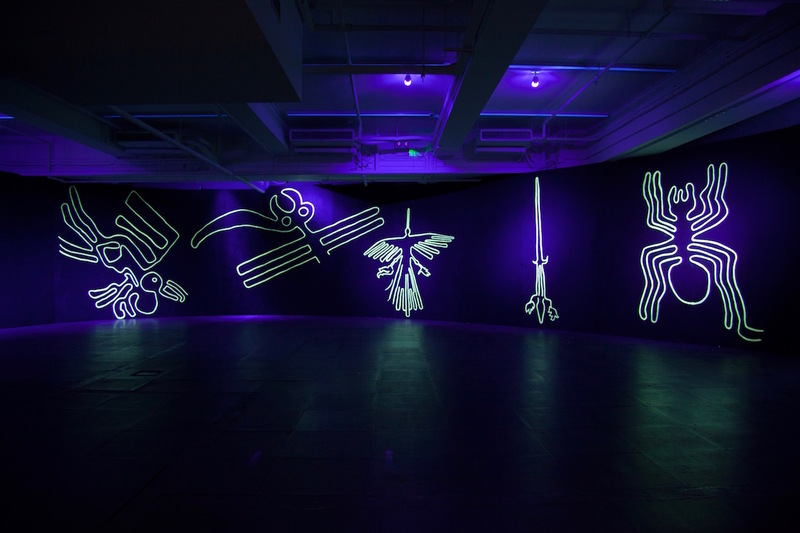 Ultimately, Neon Wilderness: Nazca Lines calls into question our ability to understand ourselves. 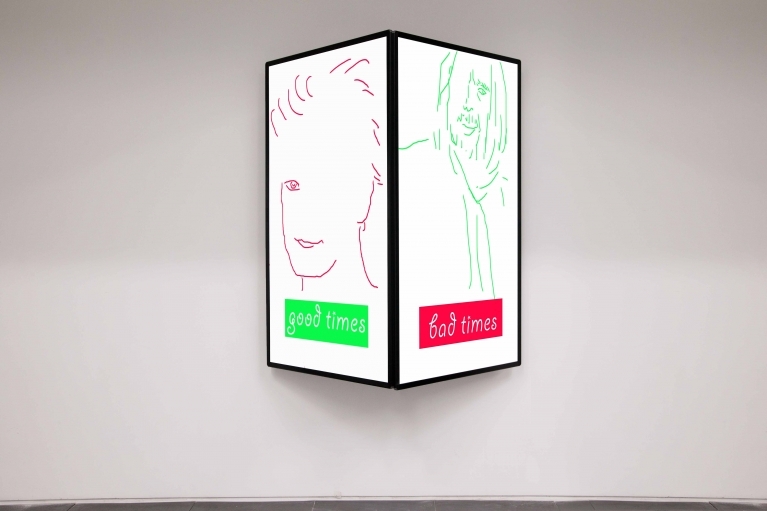 Good Times Bad Times is a two channel video work displayed on twin LED screens that loop hand-drawn portraits of winners of well-known awards from The Oscars, Cannes Film Festival, Venice Film Festival and Grammy Awards in the last century. One of the screens is labeled "Good Times" and the other "Bad Times." The artwork is based on Japanese economist Yuji Shimanaka's theory on the relation between sunspot activity and economic movement as well as American psychologist Terry F. Pettijohn's theory that during times of economic hardship the general public prefers celebrities and musicians who have hardened, mature, and masculine facial features; while in a period of economic growth celebrities often appear to be baby-faced and possess what can be described as an innocent appearance. The straightforward language and relatively basic visuals of the artwork further convey that our seemingly complex cultural movements are in essence simple. The final work of the show is titled Arrested Lightning. The video work features the artist dressed as the same vagabond from Pirate Utopias. This time he is in the midst of chasing and attempting to capture lighting. As he slowly makes his way through a frozen forest, the intense and captivating energy of the piece leads only to a comically absurd ending. From the top of a cliff the vagabond dramatically hurls a lasso in the sky to capture a bolt of lightening. The apparently serious, but nonetheless absurd attempt serves as a metaphor for the impossibility of not only capturing Mother Nature, but also understanding ourselves as well as the civilizations we construct.